It’s that time of year again: Dining Out For Life, an annual fundraising event involving the generous participation of volunteers, corporate sponsors, and restaurants. 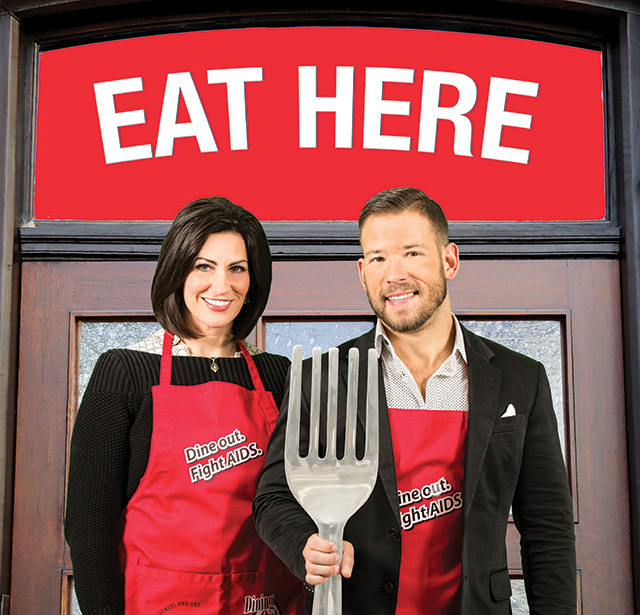 You’ll see KARE11 personalities Sven Sundgaard and Rena Sarigianopoulos, in addition to hundreds of volunteers, wearing red aprons at your favorite restaurants that are generously donating portions of their proceeds to benefit The Aliveness Project. Dining Out For Life is now produced in 60 cities throughout the United States and Canada. Across North America, more than $4 million dollars a year is raised to support the missions of 60 outstanding HIV/AIDS service organizations. This year 200 participating restaurants in the Twin Cities, Duluth, and Mankato have agreed to donate a portion of their proceeds to The Aliveness Project on April 28. Read the highlighted choices of hotspots and then plan your day to “Dine Out, Do Good” by checking out the full list of participating restaurants and the percentage of proceeds they’ll be donating at www.diningoutforlife.com/minneapolis. There’s a restaurant in a strip mall in Richfield that’s guaranteed to change your image of restaurants in strip malls in Richfield. Tucked away just south of Highway 62, LYN65 is a secret garden of a restaurant, perfect for a date night or fun feast with friends. Especially if you love food. The entrées are solid, but I recommend small­plating your way across the menu. If you skip the bologna sandwich, we’re no longer friends. Trust me. It’ll win you bonus points with friends and paramours alike. As will the burger and the chicken wings. And pizzas. I could go on. Just go. Everybody knows their way around a sushi menu by now, but if you’re looking to step up your Japanese bar food and ramen game, take a trip to Zen Box Izakaya and explore a whole new menu of deliciously adventurous treats. From the crisp, doughy goodness of octopus­-stuffed tako yaki to the crunch­-festooned fried chicken kara age, Zen Box’s menu will have you planning an outright trip to the land of the rising sun in no time. If you miss visiting on Dining Out for Life, pop in prior to your next trip to the Guthrie. Some nights you feel like Chinese food, other nights Indian. You may not realize it yet, but from now on you’re about to crave both. At the same time. Enter Chin Dian Cafe. My outlook on takeout life was changed a couple weeks back after my first few bites of Madras Chicken and veggie samosas. Is it Chinese food, is it Indian? It’s both. And the only thing you’ll care about is how to get more into your mouth. Head to Northeast for a truly unique dine in or take out experience. I have a special place in my heart for neighborhood pizza joints. Where else can you get a simple yet satisfying slice or five and chew the fat with a few friends after a long day at the office? Jakeeno’s Pizza & Pasta is a classic Powderhorn pizza parlor with everything deliciously old school you’d expect. If the weather’s nice, order up some wings on the patio and relax. Or if it’s a delivery kind of night, pick up a large cheeseburger pie with an order of wings, maybe a salad, and an order of artichoke dip and you’re night is pretty well made. Burgers come and burgers go, but the burgers at Blue Door will always be among my all­-time favorites. Frankly, nobody has come close to Blue Door’s peanut-butter-and-bacon-­laden Jiffy Burger and I strongly doubt anyone ever will. If that sounds too adventurous a combo, fear not. The menu is chock full of fabulous beefy options. Their signature cheese­-stuffed Blucys are the stuff of burger legend. And because you’re already in a festive mood, make room for the nacho totchos and SPAM bites. Start your Dining Out for Life day of meals with one of the best fresh-­baked donuts in the Twin Cities, bar none. And, by “bar none,” I mean you better grab hold of one (or a dozen) Maple Bar donuts topped with thick cut bacon. Yes, I said bacon. There is no better marriage of flavors than maple and bacon. Trust me. No matter your wanton donut desires, Mojo will have a hearty selection of uniquely delicious sweet treats. Fill up a box of cake, raised, cruller, danish, and other desires to share with coworkers or friends. You’ll be employee/friend/partner of the month for, like, the whole year. If I’m in St. Paul, it’s for a concert or, more likely, food. And just like Minneapolis’ restaurant renaissance, St. Paul is now replete with its very own tempting taste­scape. Hop over the river this year for a ridiculously soul­-warming meal at the magical Ward 6. I first fell in love with this Payne Avenue establishment after inhaling the now mythical Fatty Melt, a burger stuffed between two grilled cheese sammies. Sadly, it’s now a thing of lore, but Ward 6 always has a unique burger just waiting for you. The special beef-fat­-fried fish and chips are thankfully still on the menu and worth every pant-­expanding bite. The eagle needs no explanation, but a reminder that, in addition to a stiff drink or four, you can also grab a super juicy burger basket with fries at this downtown watering hole. Perfect for your Dining Out for Life lunchtime nosh with coworkers or late-night nibble with friends. You might think a self­-described gluten-free restaurant would result in a culinary snooze fest. You would be wrong. Completely and utterly wrong. This swiftly-­becoming-South-Minneapolis-staple is jam-packed with an impressively rich menu full of delicious bites that just happen to also come sans gluten. 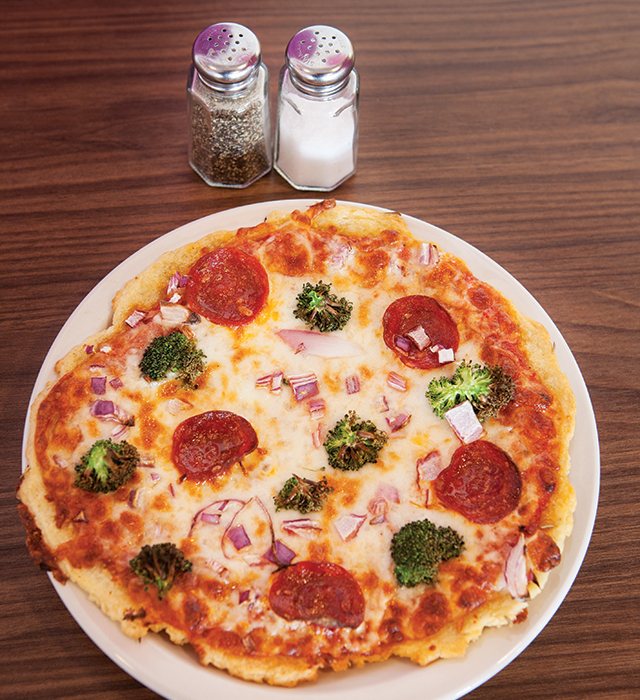 The flatbread pizza and turkey meatballs are a personal favorite, as is the cauliflower rice. For dessert, please avail yourself of the cookie dough.